Episode 4: Yankee Doodle Dandy - A Reel Education: The Musical! 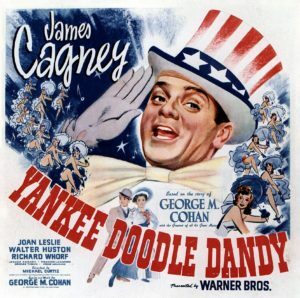 This week, Windy introduces Vinnie & Mike to the wonders of a tap-dancing Cagney in YANKEE DOODLE DANDY. 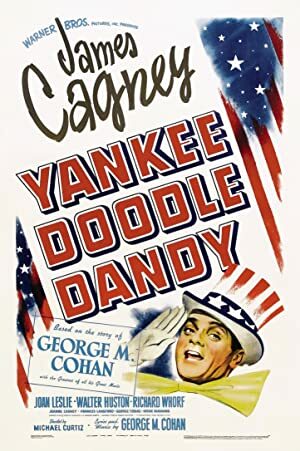 A straight-up, no frills, no unnecessary “plot” or “conflict” biopic of George M. Cohan, legendary songwriter and showman – and ego. Every patriotic song you were taught in 3rd grade was written by George M.
Directed by Michael Curtiz (CASABLANCA, WHITE CHRISTMAS, THE ADVENTURES OF ROBIN HOOD), the movie is gorgeous and the costumes are stunning. More importantly, it’s perhaps the only record of the particular style of dancing and showmanship that was a Cohan show. Cohan lived to see the movie premiere and approved of Cagney’s performance (Cagney worked with the choreographer who was Cohan’s assistant to master the quirkiness of Cohan’s dancing style). We enjoyed Giving Our Regards to the Broadway of old while watching Cagney wave that Grand Old Flag – we hope you will too. Also – we loved the hats. Plot: The life of the renowned musical composer, playwright, actor, dancer, and singer George M. Cohan.